You might be happy with the look and functionality of your current window treatments—or you might be thinking of purchasing new ones. Whichever the case, if you want a fresh look and additional character for your room, consider adding cornices. At Treasure Coast Window Fashions in West Palm Beach, our trained consultants will be happy to help you decide whether a cornice is right for you. One thing to consider when thinking of adding a cornice is whether you want your window to stand out or blend in. That will determine the type and style of cornice. Also remember that a cornice will immediately draw the eye upward, making the room seem larger. 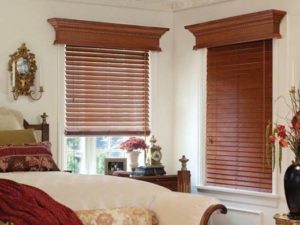 Cornices not only provide decorative elements in your room; they also cover up a blind’s or a shade’s unsightly control mechanism. The hardware can disrupt the room’s flow, which is where a cornice can help balance the window with the rest of the room. Hard Cornices – Made from wood or faux wood materials, hard cornices don’t have fabric. Hunter Douglas offers Parkland™ Wood Cornices that add the finishing touch to your window treatment. They are available in six profiles that will coordinate with your room’s décor. Available in several colors and stains, your options are limitless—you can blend with your wall color or add an accent color. Soft Cornices – A box covered in fabric that goes beyond the sides and bottom or padded box alone. With extensive fabric libraries, trims, colors, and textures to choose from, soft cornice possibilities are endless. No matter whether you add a cornice to blend with your draperies or furniture or to make a visual statement, it will take your room from ordinary to extraordinary.